Bowl of Veggies - This is the easiest and most basic advice ever. Make sure you have a bowl of fresh raw veggies on hand whenever possible. I often cut up celery, cucumbers, red and yellow pepper and mix them with some baby carrots in a big bowl. My kids will munch on them all day long. On New Year's Eve, Karla and I along with our families and some mutual friends, got together to celebrate. Knowing that it would be a long night of partying for the kids and that not-so-healthy snacks and treats would be abundant, I brought my bowl of veggies along to make myself feel better. To my amazement, at the end of the night, the only empty bowl was the veggie bowl. 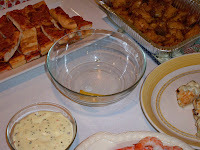 The kids ate them all up amidst pizza, cookies, chips, etc. I was so very proud. Frozen Bananas - I have to admit, my kids like their treats. And although I try to keep them to a minimum, the girls and I really enjoy cooking together and find ourselves huddled around the kitchen island whipping up a tasty dessert every now and again. The other day we made chocolate covered frozen bananas. It was simple. I cut three bananas in half and gently slid sticks into them. We put the bananas on a cookie sheet and into the freezer for about an hour. Then we melted some organic chocolate chips along with a tablespoon or so of oil in a double boiler. Once the chocolate was completely melted we took the bananas out of the freezer and dipped/poured chocolate on them. Then back to the freezer for another hour to harden. This was a yummy treat and a little better for us than ice cream. Turkey Loaf - I found a great recipe for meatloaf made with ground turkey the other day. It called for 4 cups of chopped fresh spinach and a cup of chopped fresh parsley among other yummy ingredients. It was very tasty and although its appearance was a little on the green side, the girls loved it. The recipe was in the February 2009 edition of Real Simple magazine. Good luck and be sure to share some of your sneaky treats! My mom is doing the same with my sister's children... Instead of ice cream and cookies, they now munch on carrot strips and they love it, from the 2 year-old to the 10-year old! And as a special treat she'll make them "fries" that aren't fries at all... Potatoes, with skin, cut into fries and baked in the oven with no oil. Just add a little herbal seasoning and you're good to go. It's seriously more-ish! I love to make sweet potatoe fries with dinner. I just cut them into fries, sprinkle with a little olive oil, season (one of my favorites is rosemary and a little parmesan) and bake. The girls think they are yummy and so do I!